Most faithful, churchgoing Christians today interpret the gospel in two basic ways, literally and morally. Literal interpretations emphasize the events of Jesus’ birth, ministry, death, and resurrection—understanding these to have occurred precisely as the evangelists portrayed them. Moral interpretations focus on the ethical upshot: What do Jesus’ words and deeds mean to me? What do they imply about how I should live? These two modes of interpretation—literal and moral—are absolutely essential for grasping the meaning of the gospel. But I suggest it is impossible to grasp the gospel’s fullest meaning without reading it also “analogically” and “anagogically.” What are these other modes of interpretation and why do they matter? An analogical interpretation is one that recognizes in Jesus’ words and deeds the fulfillment of specific passages of the Old Testament. In other words, the Old Testament and the New are seen as relating to each other by analogy. An anagogical interpretation (literally one that “leads upward”) involves seeing in Jesus’ words and deeds an image of the kingdom to come. A good way to think about the four modes of interpretation—literal, analogical, moral, and anagogical (this is the best order in which to present them)—is in terms of time. A literal interpretation tells us what happened in the “historical present” of Jesus’ life. An analogical one relates the significance of Jesus’ life to what came before. A moral interpretation relates it to each of us today. And an anagogical one relates it to the future. It is a pity that so many readers have abandoned the analogical and anagogical modes of interpretation, not only because they are thrilling to take up, but also because the gospel writers clearly intended their texts to be interpreted in these ways. In fact, they could not help but compose the gospels in four modes, because God’s revelation simply requires it. God reveals himself at once in literal words and historical events, but also in such a way that past revelation prefigures the future, which then prefigures the ultimate future; and all in such a way that we as individuals become morally transformed. This means that the failure of many contemporary Bible readers to appreciate the four modes entails a failure to adequately grasp God’s revelation. That the gospel’s fullest meaning is impossible to grasp without four modes of interpretation is not a new idea or something I have invented. It was rather well known to many of the most prominent exegetes, Catholic and protestant alike, throughout Christian history. St. Thomas Aquinas (1275-1274) endorsed the four modes in Question 1 of his Summa Theologiae. 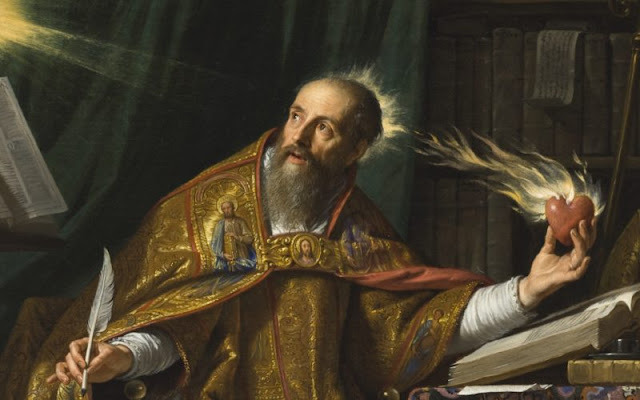 Before him, they were taken up by the “Victorines” (the followers of Hugh of St. Victor) in 12th century Paris, by St. Augustine of Hippo (354-430), and by Origen of Alexandria (185-254). Going forward from St. Thomas, they were employed famously by John Wycliffe (1320-1384), the Bible translator, theologian, and prominent reformer at Oxford. And they were even employed by Martin Luther and Jean Calvin, though this has sometimes been denied. In fact, Luther and Calvin routinely used all four modes of interpretation in their own exegesis. What they opposed was the dangerous tendency of many interpreters in their day to reject the literal meaning of scripture in favor of far flung allegorical interpretations. According to the historical practice of fourfold interpretation, however, the literal meaning is always prime and cannot be dismissed. Let’s look at an example of the four modes in action. Consider the scene from St. John’s gospel where Jesus converses with Nicodemus (Jn. 3:1-15). Nicodemus was a Pharisee and leader of the Jews, and he confessed to Jesus in private conversation that he found his miraculous signs quite impressive, indeed suggestive of a man possessed of God. Why does Nicodemus fail to understand Jesus’ meaning? Certainly, it is because Jesus’ words are meant to convey something spiritual. The literal words are true. Entry into the kingdom of God requires a “new” birth, a birth “from above” (the Greek can be taken either way). But Jesus’ words are not true in the bodily sense in which Nicodemus takes them. The new birth will be one of the spirit, not of the body through the womb of a mother. Jesus is thus telling Nicodemus (and us) something about heaven. It is a spiritual kingdom, not a kingdom of this world. But to understand this requires that we have the ability to hear anagogically. Failure to interpret this passage anagogically would indeed leave us, like Nicodemus, utterly baffled. Nicodemus still doesn’t understand. He asks, “How can these things be?” But his failure this time is a failure to see who Jesus is in relation to the Old Testament prophecy in Ezekiel (36:25-26). There God says, “I will sprinkle clean water upon you, and you shall be clean from all your uncleannesses… A new heart I will give you and a new spirit I will put within you.” The baptisms that John the Baptist performed and those that Jesus’ own disciples perform later in John 3 are preludes to the baptism of the spirit that God will perform through Jesus. Jesus is the fulfillment of God’s promise. He is not only possessed of God, as Nicodemus supposes. He is God acting out his plan in the world. Of the heavenly things that Jesus could reveal to Nicodemus, the most basic are that baptism and belief in Jesus entail a spiritual rebirth from above. There is much more to know, but none of it can be accessed without understanding that the literal water of baptism and the literal body of Christ are spiritually symbolic, spiritually full of meaning. Jesus here gently rebukes Nicodemus in a way we can interpret as “moral.” And it is a moral rebuke that applies to us as well. Be open—do not be closed—to the content of Jesus’ witness. Jesus says he speaks of what he knows and bears witness to what he has seen (Jn. 3:11). He says a kind of rebirth from above is necessary for man’s salvation. Believe him! There can be no doubt that the literal and moral interpretations of the gospel are essential. But they are, I would suggest, radically incomplete without the analogical and anagogical interpretations to accompany them. This is made clear in Jesus’ encounter with Nicodemus. No amount of hearing, seeing, and moralizing, on Nicodemus’ part will save him, unless he grasps that Jesus is not merely the man of flesh standing before him, but also a spiritual gateway to the spiritual kingdom of God in heaven. That Nicodemus does not grasp this is likely caused in part by his belief that the long-expected Messiah would be an earthly king and that salvation likewise would be earthly. Looking backwards, this passage draws an analogy between Jesus and the bronze serpent made by Moses. When the Israelites had been unruly in the wilderness, God sent poisonous serpents to bite them. Many died, but the survivors appealed to Moses with contrite hearts; and Moses, following God’s instructions, made a bronze serpent, raised it up on a pole (read: Christ on the cross) and used it to heal anyone who was dying. All they had to do was “look at the bronze serpent and live” (Num. 21:5-9). Reading forwards, the passage predicts Jesus’ death on a cross as well as his resurrection—“so must the Son of Man be lifted up”—both of which are simply incompatible with the idea that he will be an earthly king. Again, the literal interpretation is perfectly true: Jesus will be “lifted up.” But the analogical and anagogical interpretations are necessary to know what this really means, that his death on the cross will save us from death, and that he will ascend to heaven. Literal, analogical, moral, and anagogical: four different dimensions of the same words. It is fitting, it seems to me, that a savior who is the Word of God, who was in the beginning with God and is eternally with God, would be capable of speaking in a way that rings true not only in the historical present in which he speaks, but also in the past, in the present moment for us today, and in the heavenly kingdom to come. And because Jesus does in fact speak in this way, we must learn to interpret him thus. We therefore need four, not two ways of interpreting the gospel. Dr. David Corey is Professor of Political Philosophy in the Honors College and Department of Political Science at Baylor University, Texas.